Ray Floriani is the RTC correspondent for the MAAC and the NEC. Changes at the Helm: Fran McCaffery, off his outstanding run at Siena, is in Big Ten country at Iowa. The Siena administration did the right thing in promoting assistant Mitch Buonaguro to take his spot. Buonaguro recently added Craig Carter, who was on Fred Hill’s Rutgers staff, as an assistant. Iona replaced Seton Hall-bound Kevin Willard with Tim Cluess. At Division-II CW Post, Cluess made himself quite a name in just four seasons. He is revered as an outstanding tactician. Realizing other facets of the game have to be covered to succeed at the Division-I level, Cluess made outstanding hires in John Morton and Jared Grasso. Morton, formerly of John Dunne’s St. Peter’s staff, knows the MAAC extremely well. Grasso did a commendable job in a tough situation as a Fordham interim head coach last winter. He knows the area and has outstanding contacts with AAU and high school coaches which will serve well in recruiting. Picking Up the Pieces: The MAAC also was in the news regarding a coaching move of three years ago. The Matt Brady exit from Marist to James Madison is still a point of contention and debate in Poughkeepsie. Marist is still trying to recover on the men’s side, and their leadership filed suit against Brady alleging that he breached his contract by asking prospective and then-current Marist players to accompany him to JMU. A hearing is set for December. On The Tube: On the women’s side, it was announced the conference championship will be televised nationally on ESPNU. The change of the women’s championship from a Sunday to Monday afternoon time slot was crucial in securing the national audience. The possibility of another finals appearance by Marist, one of the most celebrated and successful mid-majors in the women’s game, didn’t hurt, either. If a viewer tunes in has an opportunity to learn a little more about the MAAC, that exposure should benefit the men’s side as well. Getting your name and product out there is the thing. And this can only help the conference. Siena: Recent glory years appear to be at an end with the departure of Edwin Ubiles, Ronald Moore and Alex Franklin. Despite losing that trio and weathering a coaching change, it would be wise not to write the Saints off as of yet. Junior guard Kyle Downey, senior Clarence Jackson, a dangerous outside shooter, senior forward Ryan Rossiter and junior forward Owen Wignot are all proven players who have experienced success. Siena is not the program they were the past two seasons, but they are very good and won’t give up the title without a fight. Iona: Twenty-one wins, 12-6 and third place in the MAAC — it was a fine showing by the Gaels last season and things should keep headed in a similar direction this year. Scott Machado, an outstanding performer at guard, and Jermel Jenkins are two of the headliners back for Iona. The Gaels did lose some inside presence with the graduation of Jonathan Huffman. At 7’0, Huffman was more apt to shoot a three but still afforded a respectable presence in the paint. In his absence, there’s a stocked cupboard for new coach Tim Cluess to work with, a rarity for new coaches at this level. St.Peter’s: AD John Dunne brought in veteran coach Bruce Hamburger to replace John Morton, who exited for Iona. Marlon Guild was also promoted to full-time assistant, along with Dalip Bhatia, who makes the leap from video coordinator. On the floor, everyone is back from a surprising 11-7 MAAC finish last season. There’s no sneaking up on anyone this season and there’s a strong veteran cast to meet the challenge. Ryan Bacon returns in the low post, Nick Leon is a tough three-point shooting and penetrating guard and Wesley Jenkins is a proven offensive threat. This is a team that should contend. Fairfield – The Stags were 20 minutes away from an upset over Siena and ticket to the Big Dance. In the second half, the Saints rallied to capture the MAAC championship in overtime. If the Stags won the game, it would have been labeled an upset, but not a big one in the eyes of those who follow the MAAC closely. Fairfield returns a key contributor from their run last year in point guard Derek Needham. The freshman prodigy was one of the best players in the MAAC and will remain a focal part of the Fairfield attack. Anthony Johnson, a solid inside player, is gone. Coach Ed Cooley returns a good cast while having the luxury of not worrying about the lead guard spot. Rider – The Broncos lose an outstanding player in Ryan Thompson. Tommy Dempsey has a very strong nucleus back from a team that was highly touted in the early going, but finished 9-9 in the MAAC and was sent home in the second round of the conference tournament. Novar Gadson and Mike Ringgold make for a pair of 6’7 forwards capable of scoring and hitting the boards. Justin Robinson is proven at the guard spot and Jhamar Youngblood, a senior guard, is talented. The key for the latter is shot selection, as Younblood canned just 23% of his threes last season. A year ago, Rider seemed to depend a lot on Thompson. This year, the supporting cast is a year older, wiser and capable of stepping up. The Broncs could be a team pundits forget about, but shouldn’t. Niagara – A .500 team in conference a year ago, the Purple Eagles had their share of injuries to deal with. Still, they were the only MAAC school to defeat Siena, with a convincing win in February. Joe Mihalich will lose his top three scorers in Tyrone Lewis, Bilal Benn and Rob Garrison. Lewis was one of he MAAC’s best during his days at Niagara. All three, however, will be missed. Anthony Nelson, a 6’1 senior, is the top returnee. After that, there are a lot of questions, especially up front. Somehow, Mihalich always finds an answer. Canisius – Tom Parrotta reels in the tallest player in program history. Marial Dhal, a 7’3 native of Uganda, is a transfer from Hillsborough (Florida) Community College and is eligible immediately. Parotta believes Dhal’s defense is ahead of his offense at this juncture, but his obscene height still makes him “a game changer,” according to the coach. A prime concern for Canisius is replacing Frank Turner, the outstanding guard who recently signed a pro contract to play in Holland. Beyond that question mark, there is a strong cast returning, and a great opportunity for the Griffins to improve on their 15 overall wins (the Griffs’ best total since ’01) next season. Manhattan – The Jaspers lost two point producers from last year in Darryl Crawford (14.8 PPG) and Antoine Pearson (7.9 PPG), but Rico Pickett, the leading scorer last season (17 PPG), is back for another go. Pickett is a dangerous three-point shooter but can also shoot his team out of a game if he isn’t careful. As a senior, he will be expected to show a more judicious shot selection. 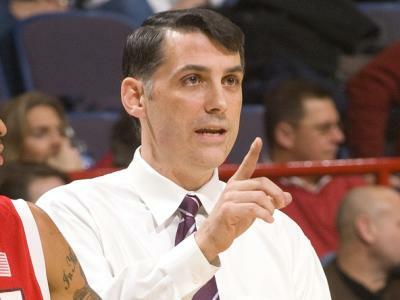 Manhattan needs help up front and hiring Scott Padgett as an assistant to work with the frontcourt players can only help. The Jaspers were 4-14 a year ago in the MAAC but played better down the stretch; The latter weeks saw wins over Iona, Towson (Bracket Buster) and Loyola in the opening round of the conference tournament. It was an encouraging finish and something to build on this season. Loyola – The Greyhounds finished 6-12 a year ago in conference play and lose a major three-point shooter with the graduation of Brett Harvey. Harvey averaged 12.5 PPG and was a consistent threat beyond the arc for the Greyhounds. Jamal Barney, a senior who averaged 12 PPG last year, returns. He’ll plan to take more of a leadership role this year, and junior Jhared Hall will be counted on to provide a consistent threat from three. The inside game will need to be addressed as Loyola looks to move up in the MAAC order. Shane Walker a 6’10” junior, is an option inside, but he needs help on a nightly basis. Marist – On paper, Marist lost only one senior from last year. The half-full mindset is everyone is back; The half-empty approach says everyone back totaled one win a year ago. The only noise the Marist program has made these days surrounds the ramifications of Matt Brady’s departure for JMU a few years ago, something Marist has yet to recover from. RJ Hall, a junior guard, Korey Bauer and Rob Johnson have had their moments, but Marist needs on the floor and in the program. Chucky Martin did not walk into an easy situation two years ago and this will be a challenge once again for the Red Fox mentor. One of the main objectives of commissioner Rich Ensor is for the MAAC to play a challenging non-conference schedule. This helps improve the conference RPI while getting teams ready to represent the conference in postseason play. St. Peter’s makes a trip to the Paradise Jam in the Virgin Islands, where the field includes Xavier and Clemson. The MAAC hosts the Old Spice Classic in Orlando during ‘Feast Week’ and Manhattan will represent the conference with a first-round meeting against Wisconsin; Canisius will have an early challenge when they face Syracuse in the Carrier Dome come November. There doesn’t appear to be a team like Siena of recent seasons who can net a first-round NCAA Tournament win. This year’s conference race will be quite competitive and whoever survives will be battle-tested and a formidable representative. The conference tournament will move in 2012 for at least three seasons from it current home at the Arena at Harbor Yards March to Springfield, Massachusetts. The closest school to Springfield is Siena, 90 minutes away. It will be interesting to see how it draws fans and media alike, as Springfield represents the first site in the conference’s three-decade history without a nearby league school that can be relied on to bring in some local fans. This entry was posted on Tuesday, August 10th, 2010 at 9:33 am by Brian Goodman	and is filed under summer school. Tagged: Bruce Hamburger, canisius, fairfield, iona, john dunne, loyola, manhattan, Marial Dhal, marist, matt brady, niagara, rich ensor, rider, scott machado, siena, st peter's, tom parrotta, tommy dempsey. You can follow any responses to this entry through the RSS 2.0 feed. You can leave a response, or trackback from your own site.